Windows 10 compatibility checker is imperfect. Windows 10 won't necessarily work well with Windows 7/8 drivers. Windows upgrade rollback has serious limitations. I had foolishly sent someone down the upgrade trail on her own, which resulted in a panic message to me when it rejected her password after the upgrade. Spent a large amount of time resetting the password on her Microsoft account, but that didn't help. Finally had to go on site, where I quickly discovered the problem, NumLock turned on with a compact keyboard. The Windows 10 upgrade didn't migrate the keyboard Registry fix I had applied to earlier versions of Windows. So applied new fix. I then went through the hassle of reversing the hijacking of program associations by the upgrade, and upgraded all applications to current versions (which eventually proved to be a big mistake, as I explain below). Not a great experience I thought, but probably still worth it. 3 days later I got another panic message. The problem was that folder view wasn't right for her pictures, and she was unable to change it. Based on experience with her I thought this was probably cockpit error, and so wasted much time and grief telling her what to do before finally turning to (excellent) TeamViewer to do it myself remotely (which I should have done in the beginning). And indeed, folder view options were disabled. She had an administrative account, so that wasn't the problem, Explorer registry setting wasn't wrong, and I couldn't see any Policy issues. So I decided to try System Restore, rolling back to right after the upgrade, and happily that solved the problem. I still don't know what caused the problem, possibly cockpit error, possibly malware, and worried about a possible recurrence. This is an old Windows issue that's never been resolved. It seems to be a result of not having proper drivers for USB: host controller, card reader, etc. Which wasn't good news since support for that Gateway SX2802 desktop computer seems to have ended the day Gateway shipped it. So I spent considerable time trying various drivers for card readers from major chip vendors, but no joy. Registry data suggested the card reader controller was by Alcor, but that didn't prove a fruitful path either. Finally I remembered I had installed a USB 3.0 PCIe card in the computer for the WD Passport. It had a strange chip, Etron EJ168, rather than the usual Renesas or TI. And when I disconnected and reconnected the WD Passport, one of the two WPD driver errors disappeared and reappeared in sync. 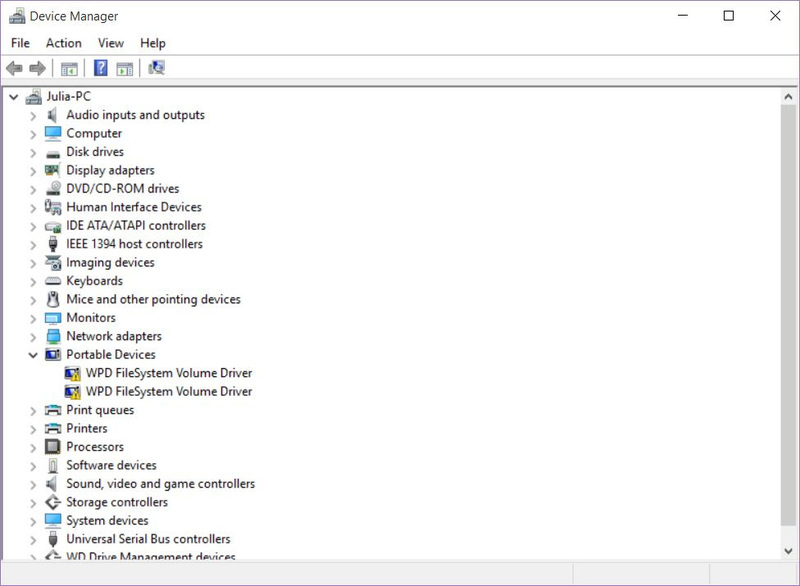 But alas, installing Etron EJ168 drivers didn't help either, even when I laboriously tried updating drivers and deleting devices, not helped by the fact that the USB keyboard and mouse would stop working when I blundered on their entries. In frustration and desperation I finally thought to roll back (revert) to Windows 8.1, assuming that would get the system back to where it was before the Windows 10 upgrade mess, but that proved to be a very bad assumption. The rollback seemed to go well enough, but as soon as I started checking operation I found that some of the applications were screwed up. I noticed these were all applications I had updated after the Windows 10 upgrade, and the light dawned. 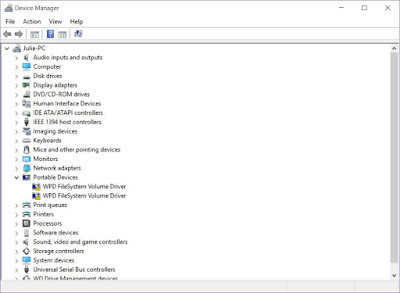 While the Windows 8.1 and 10 installations are separate, the applications (in Program Files, etc.) are not, so the old Windows 8.1 installation was now out of sync with the updated applications. Ugh. Last but not least, Windows 8.1 then restarted the Windows 10 upgrade process on its own. Clicking cancel seemed to do no good, and there's no obvious way to turn it off. I finally solved the problem by (a) uninstalling and hiding KB3035583 and (b) unchecking Windows 10 Upgrade in Advanced options. What a nightmare. I'm guessing I wasted at least 8 hours in total. And it's left a very bad taste in my mouth.